Young George is one of the lucky ones. His mum was rescued before he was born, and so George has only ever known a life of kindness, and it shows. 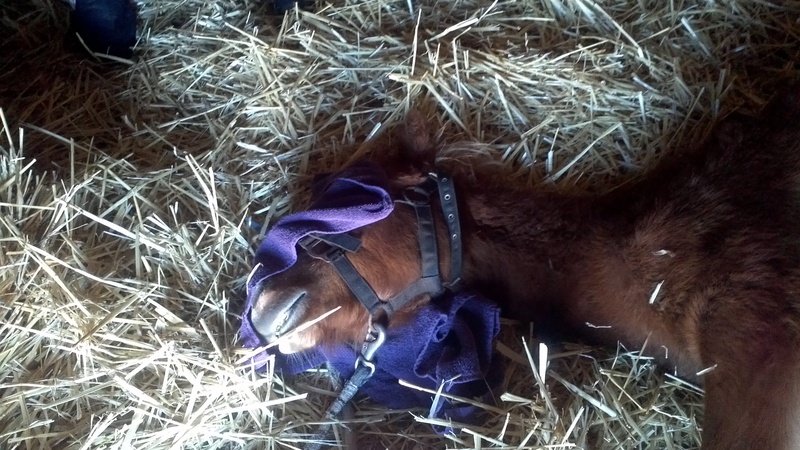 He is a confident, relaxed and happy little foal. At the time of writing (June 2014) he is just nine months old, still with his mum, Peaches and ‘aunty’ Cherry. At Honey’s Pledge we believe there are so many animals reliant on humans for their care in need of homes, that there is no need for us to breed more animals. Our one exception is we do allow very occasional hatchings of poultry. The reason for this is to enable my young daughter to have some experience of the miracle and responsibilities of new life. As lovely as it is to have baby animals (we love puppies, kittens, foals, calves, lambs, kids, and so on as much as anyone) there are thousands and thousands of animals put to death each month in want of a home. Therefore an essential responsibility for us was to have young George gelded (castrated). This is also a practical requirement when caring for animals in a domestic setting. An ‘entire’ male animal needs to be segregated from females and can be challenging to handle once beyond the ‘cute’ stage. So yesterday was the day. George was very calm although this was his first time in the loose box and first time in a headstall and lead rope. He had a injection to sedate him, and then had a general anaesthetic administered so he was blissfully asleep during the whole procedure. Once under anaesthesia our vet started the procedure, with a vet nurse on hand to ‘top up’ the anaesthetic as needed. The necessary surgery was quickly accomplished and the vet team then waited with us until George came out of his anaesthetic. Now for 24 hours ‘rest’ time with Mum in the loose box to enable blood clots to form and then back out to the paddock to ensure swelling is reduced. George will be monitored closely however he is already racing around back in the paddock, a happy and carefree little man. A wonderful next stage yesterday for two of Honey’s Pledge special residents. Remember Ruth who came to us almost two years ago? 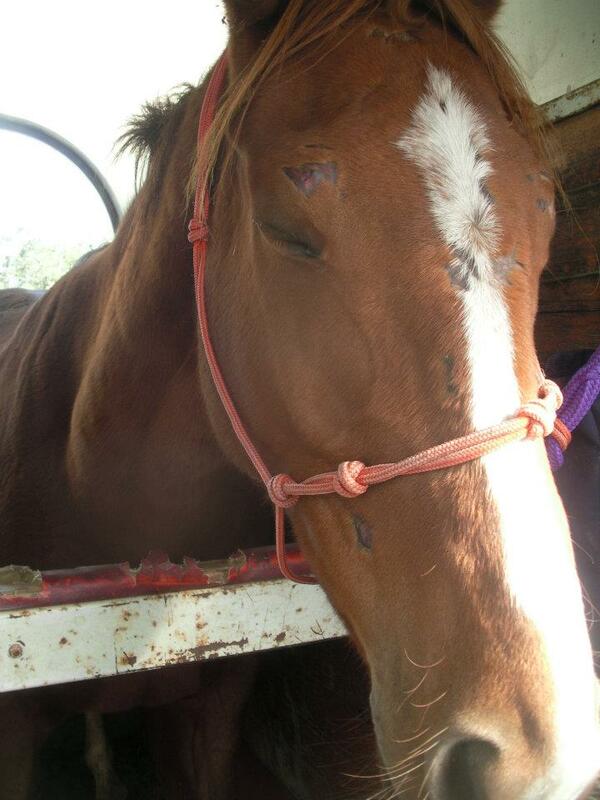 It has been a long haul with surgery to remover her eye and repair her leg ($8,000 of vet costs funded by us), but yesterday marked yet another new beginning for a special horse. Until now we have kept Ruth is smaller paddocks with a companion to minimise the risk of any harm to her vulnerable leg. Stage by stage she has been moved to larger areas. Yesterday was the big day. Leading Sophie, with Ruth and Troy following, I opened the gates to the ‘grasslands’…around 100 acres of grass and woodland where many of the horses spend the summer and autumn running as a herd. Everyone loves the grasslands and Ruth and Sophie have not been permitted out there until now. I took off Sophie’s headstall and the two mares trotted off for a look around, then did a U turn and galloped back past me, flying like the thoroughbreds they are. It did not take them long to join the two herds with Daniel, Bear, Ginger, Cody, Manfred, Princess and Robbie, as well as Troy. Here are Ruth, Sophie and Troy resting up after a big day. One of the delights of summer is the arrival of beautiful summer fruits. Two of our favourites are peaches and cherries. This year we have an added delight……..Peaches and Cherry, together with Peaches’ baby………are starting on a new path in life. We met Peaches and Cherry back in autumn. 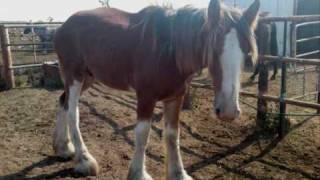 We were on a property assisting with another horse when we saw them in a three sided shed and yard. Their carers at the time could not get near them. They were being offered for sale, unhandled and wild. Cherry had just had her colt weaned from her. We were concerned that, if sold, they could well go from home to home, unhandled and without a safe future. As they are attractive mares they may well have been used as brood mares to produce more ponies into a society with more horses than we can care for already. Once too old or weak to breed they would be sent to the sales or the knackery. A contact agreed to take them, provide training and rehome them under a contract. An offer was made to do a trade of some much needed hay (as this was a time when fodder was scarce) in exchange for these ponies. Loading them onto a float was a major event. They made it safely to their new home. Both refused to have any contact with humans and were very frightened. Before training began however it became apparent Peaches was in foal and there was a suspicion that Cherry was also in foal. So the focus shifted to ensuring they were in a suitable paddock for foaling. In September Peaches safely gave birth to a lovely little colt. 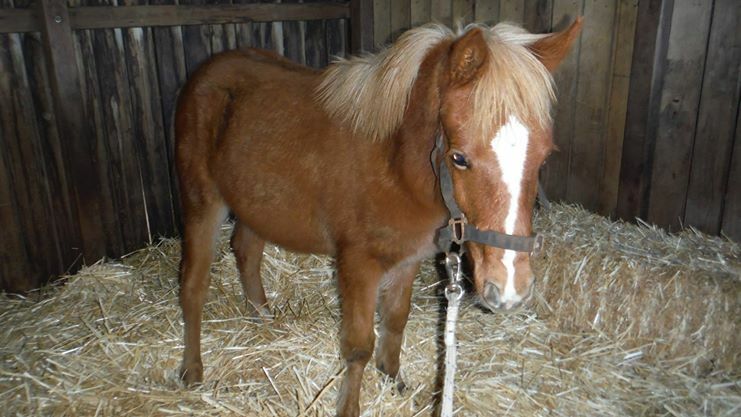 The carer was wanting to separate the foal at 4 months and sell separately to his Mum. Whilst we appreciate that there are many different ways of managing situations, this was not what we wanted. Fortunately we were able to come to an arrangement, and Peaches, Cherry and bubs have come fully back into the care of Honey’s Pledge. Today they made a float trip to a skilled friend who will undertake basic handling for the mares so we are able to place them into permanent homes, and bubs gets to stay with Mum. We were very pleased at the condition they had gained over winter. They all looked fantastic. Bubs is growing fast and Cherry has gained at least 1 hh. Better still it is clear that Cherry is not in foal. Please follow us on Facebook as we enjoy a new start for these three lovelies. PS early reports tonight are really positive!!! First meeting , cowering at the back of their shed. Peaches and bubs, a whole new future. “Mystery glows in the rose bed, the secret is hidden in the rose. To see the wonderful transformation of Rosie click on the link below…..
A great (and courageous) friend went to a well-known knackery on a mission to bring out two horses, one for her rescue organisation, and one for us, in time to enable Virginie to work with us and share her invaluable knowledge. The pony who came to us was Sally. See her story https://honeyspledge.org/?s=sally. The other was Chico who joined Sally in the paddock. My friend specialises in standard bred rescue and rehabilitation. When at the knackery yards she noticed a number of standardbreds in the yards, two with leg injuries. The following week, when she returned to the knackery, these two standardbreds were still there. We learned they had been in the yards, witnessing all of the horrors of the knackery, for at least two weeks. Two weeks of watching other horses being forced into the shute, of shooting and dismembering, the blood, the fear, the stench. Waiting their turn. It was nearing dusk as the float pulled in, and we unloaded the filly. She was thin and underdeveloped, absolutely covered in bites and kick marks, with rain scald, and with an old, obviously untreated wound, to her hind leg. On checking her brand we found she was only just 2 years old, and did not have a name. She had obviously been sent to the sales or direct to the knackery as she was unsuited to racing. My young daughter was with us, and immediately she asked that the young filly be named ‘Rosie’. The first touching moment was seeing Chico, who had been at the knackery with Rosie until the previous week, recognise her and come to the fence with a whinny of welcome. I hope he was telling Rosie not to be scared any more. The second was two days later, when finally allowing herself to relax after the horror of the past weeks, we saw Rosie stretched out, in the fresh grass and sunshine, in a deep deep sleep. Virginie did some initial work with Rosie but mainly we allowed her wounds to heal and for her to gain confidence in the paddock. Also, just weeks after the arrival of Rosie and Sally, we had five rescue horses and ponies arrive from a deceased estate, three of them needing very high levels of care. One of these, the lovely mare, Jacqui, immediately ‘mothered’ Rosie, allowing her to share her feed bucket and keeping close by. We moved Rosie up to the house paddock to allow more time for handling her, as she did not like anyone picking up her feet, especially her previously injured hind leg. One day I noticed a fracas near a large shed between Rosie and a pony over some hay. 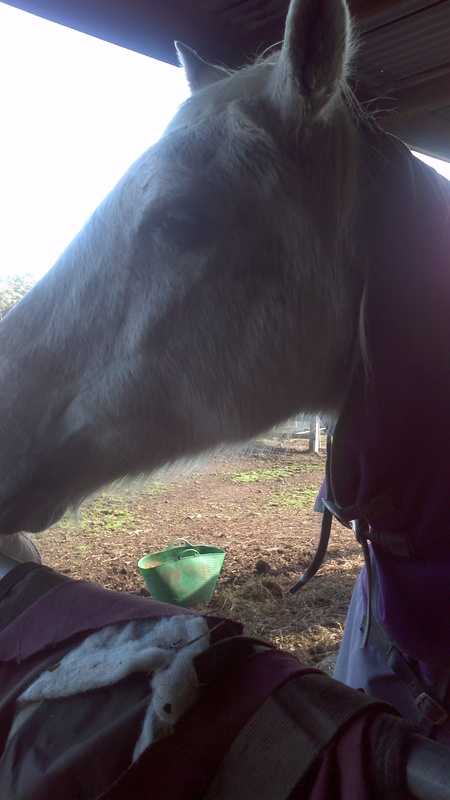 Like many horses who have experienced food deprivation, Rosie would get defensive about food. Soon after I saw Rosie limping and going to check, found a horrific wound on the coronet band of her hind hoof, with arterial bleeding. Unable to get our usual vets, I contacted a friend who recommended another practice close by. Luckily they were able to attend and were experienced with young unhandled horses. I could not work out how the wound had happened until days later I saw two holes in the shed wall. These were about 2 meters off ground level and showed, on kicking out, Rosie had put BOTH hooves through a solid corrugated iron wall. 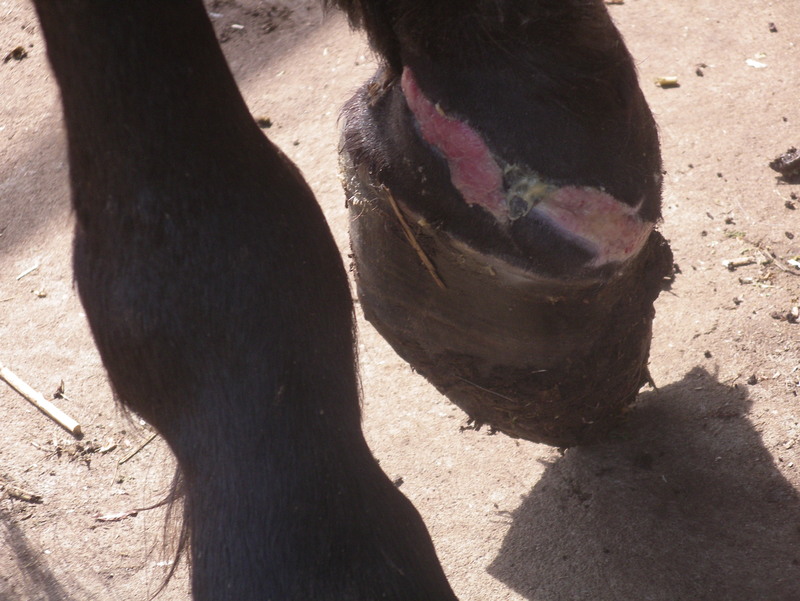 I felt sickened at what would have happened if she had not been able to release her hooves and how lucky we were that thr was not far more terrible wounds. 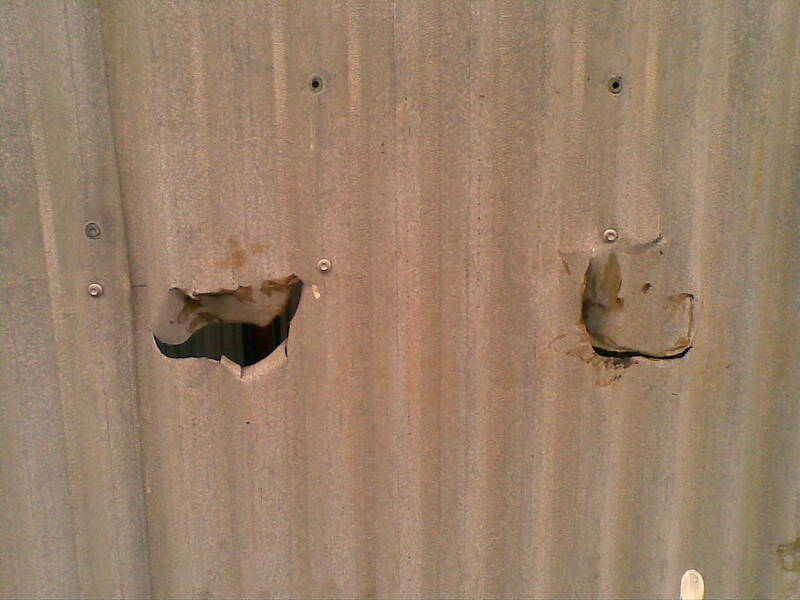 Holes in the corrugated iron shelter. Fortunately there was no damage to Rosie’s tendons but she needed to be stabled to keep the dressings dry, and to have regular dressing changes. This presented a challenge. We received invaluable assistance from a local trainer and from experienced friends assisting with Rosie. Rosie LOVED her stable and even when her leg had healed was very reluctant to give up the deep straw and shelter. We were thrilled when a dear friend was willing to adopt both Jacqui and Rosie.. Our friend was studying the use of herbs to promote health and healing in horses, so Rosie was the beneficiary of this knowledge, as well as living in a loving home. 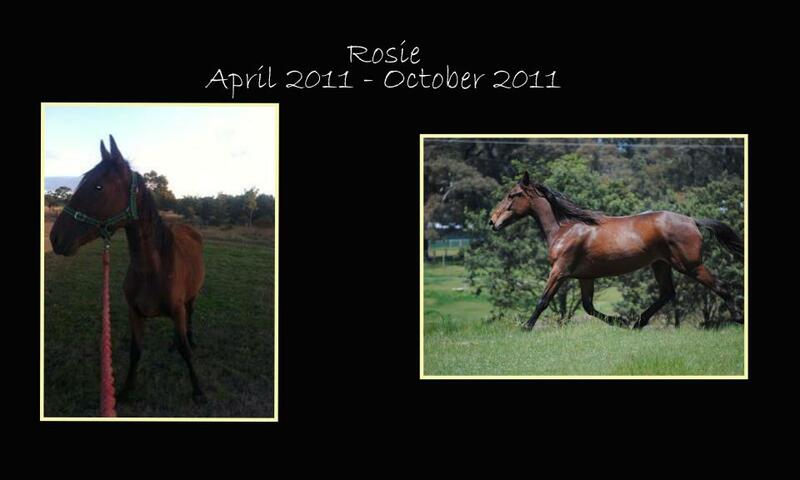 Rosie has developed and is now a stunningly healthy and happy horse. Affectionate and relaxed. This rescue was only possible due to a number of people working together to their strengths. My friend who had the courage to go to the abattoir, Virginie and Pol who gave handling assistance. the vets who treated Rosie, my wonderful friend who gave Rosie a forever home and continued her rehabilitation. The secret hidden Rose is now fully revealed in all her glory. Often horse rescuers will get requests for a pony who is totally reliable, rideable, ‘bomb proof’ and suited to a child to take to pony club. A lucky few are valued by their families, who see their care as a lifetime responsibility and reward the pony for the service they have given. Others are passed on from child to child, family to family, and finally, too old to be ‘useful’ they are abandoned in a paddock, allowed to be given to an unsuitable home. sent to auction, sent to the knackery. Saffron has clearly had better times.Saffron was someone’s beloved pony once. We first heard of Saffron last week with a call from a neighbour and friend. She rang to pass on the information that a horse had been found on the main highway. A concerned person had seen her in her gateway, and thankfully she quickly moved her into her garden and secured the gate. This lady has no experience with horses, but her one thought was…’If this were my pet I would want her safe’. She then set about contacting local vets, the shire and neighbours to try to find who the carer was. After putting an interim post on FB I offered to assist with the horse, getting some better identification and a photograph plus anything else required. On arriving I found an aged pony, initially reluctant to handled, she backed away, but with gentle talking she allowed me to put on a headstall and do a quick check over. She was clearly a pony who, although rugged, had had little other attention. The garden had ample grazing and the good Samaritan was happy for her to stay put for the time being so, I gave some basic care advice and waited to see if anyone claimed her. 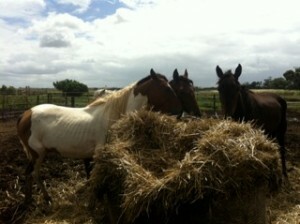 I also made enquiries with all local horse people and feed suppliers but no one knew the mare. I later discovered that Saffron had been seen on the highway for at least three days. 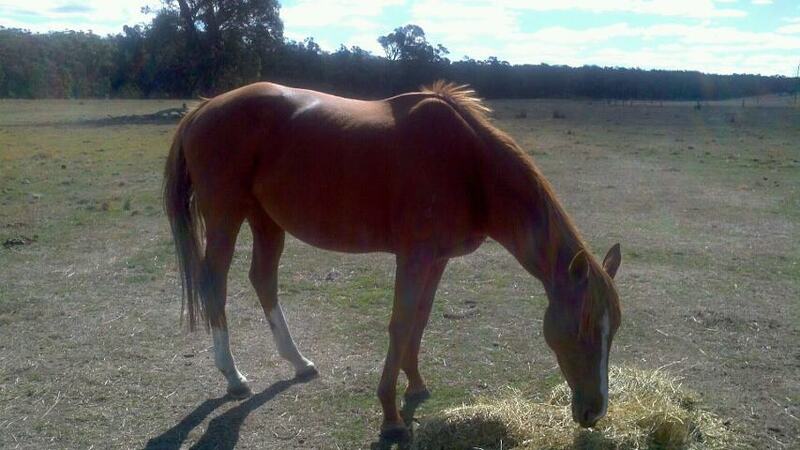 As the highway comes under the jurisdiction of VicRoads, the local ranger was not permitted to take action to secure and impound the mare…so Saffron had been left where she was. Apparently another person had put her in a nearby paddock, but for some reason she had been put back out on the road. 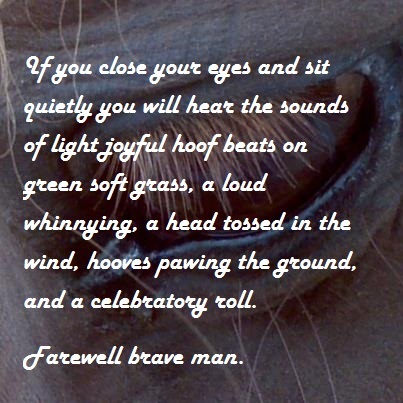 The owner went on to say that, as the mare seemed happy where she was, did they want to keep her? This quick thinking and compassionate person agreed. We arranged for Saffron to be surrendered on to Honey’s Pledge. As a dentist was attending that week, Saffron has already had her teeth attended to. Watching how Saffron preferred to reverse rather than move forward, and her funny high stepping walk got me thinking. Saffron is so reluctant to walk forward she had to be reversed onto the float and then turned, but she did it. On arrival on a wet and bleak day, the float was backed into a large yard so Saffron could unload straight into the yard. 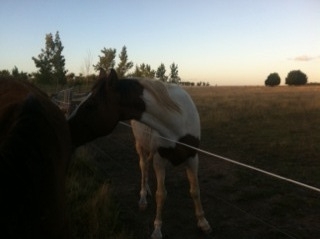 She moved onto the fence line where there were other horses and stayed there. After time to settle I went in to assess Saffron, put on a new rug, show her where the water is and start her on a small feed. Quickly it was apparent that Saffron could not see. She cannot see the feed bucket, she stumbled over the water trough and was trembling as she tried to negotiate the strange environment, including the sounds of different animals in the vicinity. The yard was not suitable to leave her in unattended and it is muddy and slippery. So with much coaxing and gentle words, I was finally able to get Saffron safely into a loose box. We are just at the first night. After working her way around the walls with many bumps, Saffron seems to have settled. I have to feed and water her at regular intervals as she cannot find her feed and water buckets yet. She has a new warmer rug on and Maisie the goat next door for company. Tomorrow the vet will assess Saffron and we will get a better idea of what is behind her loss of sight and any other health issues. ‘If she were mine I would want her to be safe……..’. UPDATE: The vet has examined Saffron and she is totally blind. The blindness appears to be the result of past eye issues that have not been treated. She is not in pain but at present is disoriented in her new home. Unprecedented for us, we have put out an appeal to assist us with providing a safe paddock for Saffron. Any person involved in rescue has to make choices. So often it is said, ‘But you cannot save them all’ (with the sub-text ‘So why save any?’). No we cannot save them all, we cannot change all lives, but if we can change the life of one animal that is something. Rescuing Sophie was a matter of chance, a matter of choice, and like the novel Sophie’s Choice, the journey has been a dark journey of betrayal and cruelty. I first ‘met’ Sophie as post on a Facebook page dedicated to rescue. 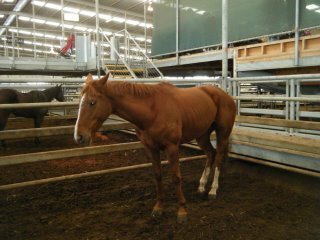 Every two weeks photographs of horses in the saleyards on the night prior to the auction, would be posted, to encourage attendance at the sales and for appropriate people to bid and secure the future of as many of the animals as possible. At the saleyards. ‘Laura Jane’ the Wednesday after failing to win at Geelong on the Friday. 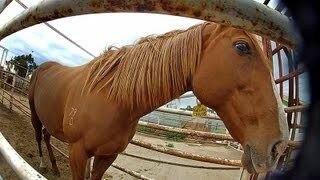 To understand the reality of saleyards here is a film by a rescuer of horses. The night following the sales was always a mix of joy, finding out who had been saved, and depression at those purchased by the ‘meat men’, to be driven onto trucks and sent to a knackery, for slaughter. Rescuers know the meat men and it was established that Laura Jane had been bought by a Melbourne knackery. This same knackery was the subject of an undercover investigation. Beware footage here is very confronting. After a number of rapid telephone calls, a rescuer offered to take Laura Jane, with some financial assistance for the purchase price. We made contact with the knackery and secured Laura Jane. She still had to make the journey to Melbourne and had to stay at the knackery until she could be collected. 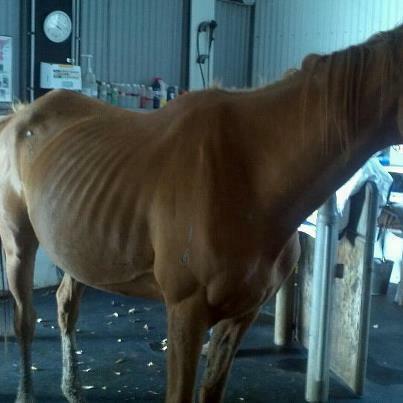 Here is how Laura Jane looked now just nine days after her last race. Transported from Geelong to Echuca, at the saleyards, trucked from Echuca to Melbourne and kept in the yards. Laura Jane was given a new name and went off to be rehabilitated and to be trained as a riding horse, with the contractual requirement she would be rehomed under a contract to protect her future. The months passed and there were positive updates regarding her overall nature and progress. Then it became apparent, through the rescue network, that there was a problem. The full story is confidential, but Honey’s Pledge became aware that Laura Jane was at a property known for issues in regard to animal welfare. Fortunately we were able to arrange immediately to collect Laura Jane. We found a listless horse, looking aged for her years, covered in bites and kicks, with pressure sores, and a low body score. Even her manure showed that she had been eating dirt to ‘survive’. She was taken direct to our vet practice and left as an inpatient to make sure she had the best care while she was fully checked, restarted on food and water and treated for parasites. This is a critical stage with rescue as horses can go downhill rapidly with colic. We also changed her name as a symbol of a new future to Sophie, meaning ‘wisdom’. Sophie then came back to Honey’s Pledge to gain condition. She settled in well and over time her bites and kicks healed, and after two months her pressure sores resolved. Sophie has one fear, being without food. This leads her to be aggressive at ‘defending’ her food, and unfortunately she caught her hind fetlock in a loose strand of wire. The injury was severe, cutting to the joint. Our wonderful vet’s attended and with their care and some prolonged nursing Sophie’s leg is healing. The damage means Sophie can never be ridden and will have a possible weakness in the fetlock joint. Every day I look out of my window and see these two together, both ‘wastage’ from the racing industry. Sophie could so easily have been Nature’s Child if fate had not intervened. I rejoice in watching their life now free of fear, with plentiful food, water, shelter, companionship. The next stage is now underway. A wonderful family wants to adopt Sophie as a companion. They are happy to care for her in exchange for love, nothing more, nothing less. In order to rescue, it is essential that there are new safe homes out there, to make room for the next ‘choice’. No we cannot save them all, but with your help we can save more.